Today we were to have gone to our friends in Long Eaton again, but P felt rotten – we’ve both been sneezing and coughing recently, and I spent much of Sunday in bed, and he felt in need of an early night, so we pleaded off. 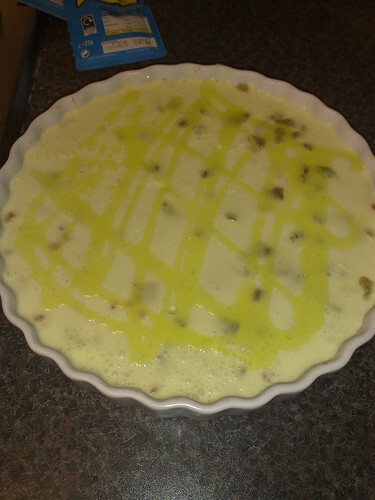 It’s shame, because I had already made our pudding – and now we have a diet-unfriendly dessert festering in the fridge that no doubt will go the way of all flesh over the coming days. This recipe was pretty much invented out of the base of something off a jelly packet. I’ve been eating sugar free jelly a lot recently, remembering it as a diet tip from years ago. It has next to no calories and is something sweet to finish a meal with. So, make a biscuit base out of a third of a pack of butter and a packet of ginger biscuits. Melt the butter, crush the biscuits, combine, and line a tart dish with them. Scatter about 100 grams of crystallised ginger over the top and press into the base. NB, you will need to press the ginger in more than that, otherwise it will poke through the cheese layer in an unsightly fashion. Put the base into the fridge to chill. Make the jelly with half a pint of boiling water, reserving two jelly cubes to one side for the garnish. Add 250grams of soft cheese to the jelly and mix well. Pour slowly over the set biscuit base and return the fridge to set. When the cheese layer is completely set, garnish: melt the remaining jelly cubes directly in the microwave with a tiny amount of water. Using a squeezy garnish bottle, make swirly patterns over the set cheese. This was… OK. But a number of learning points. 1pt of jelly/cheese is barely enough to cover the flan dish, and I thought it would be masses. Perhaps individual ones instead? My crystallized ginger poked through the jelly layer and looked unappetising. The cheese mix seeped through the biscuit and made it hard to get out. The jelly garnish on the top was disappointing – and after I bought a squeezy bottle specially – perhaps with some green food colouring it would stick out more. This entry was posted in Uncategorized and tagged pudding club. Where is the lime? Was it lime jelly? And the important question — tasty or not? 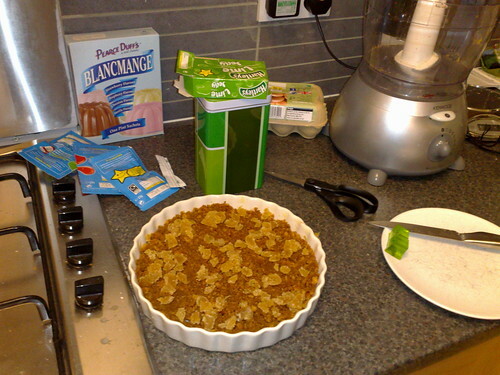 Remember the biscuit-based mousse I used to make? with that you needed to leave the jelly mixture til cool but not set, so maybe something similar with your recipe would stop it soaking into bics? Mum – what was it you whisked into jelly to make the mousse? Maybe whisking the cream cheese would increase the volume a bit more. It was lime jelly, but the taste of the lime didn’t really come though as strongly as the ginger. And yes, Kara, jelly comes in cubes (although sugar free jelly comes as powder) – you can see two cubes on the plate in the first photo.